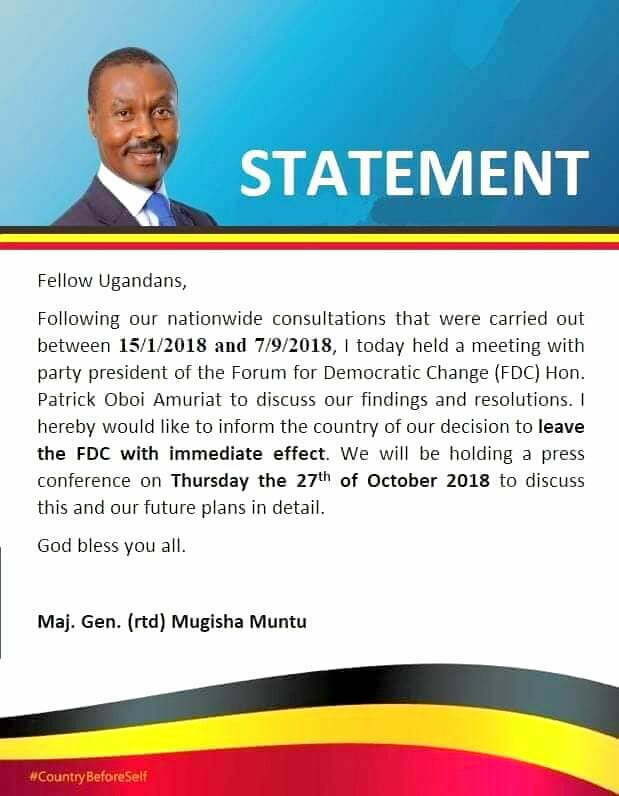 Former Forum for Democratic Change (FDC) President Maj Gen Gregory Mugisha Muntu has said a statement announcing that he has quit the party was released prematurely and carelessly. 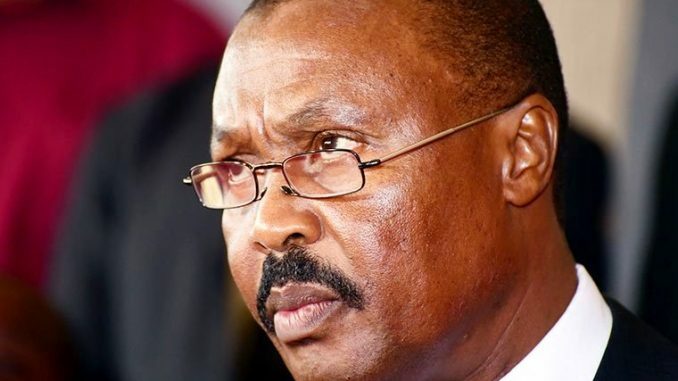 The statement released a few hours ago indicated that Muntu had left the party with immediate effect. It made reference to nationwide consultations carried out between January 15 and September 7, 2018, and a meeting held earlier with party president Patrick Amuriat Oboi at Fairway Hotel in Kampala. 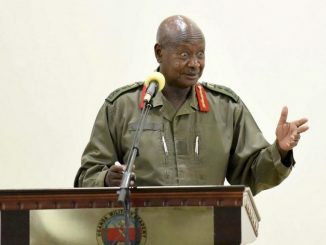 It was believed that he met Amuriat to communicate the outcome of the consultation process he launched after he was defeated for the FDC presidency. Muntu was flanked by former FDC Secretary General Alice Alaso, MP Stephen Ochola, the newly elected Arua Municipality MP Kassiano Wadri and party elder Sewava Sserubiri during the meeting. As they left Fairway Hotel, Muntu said he will release an official statement in one or two hours. But he says that the statement that came out thereafter was premature. 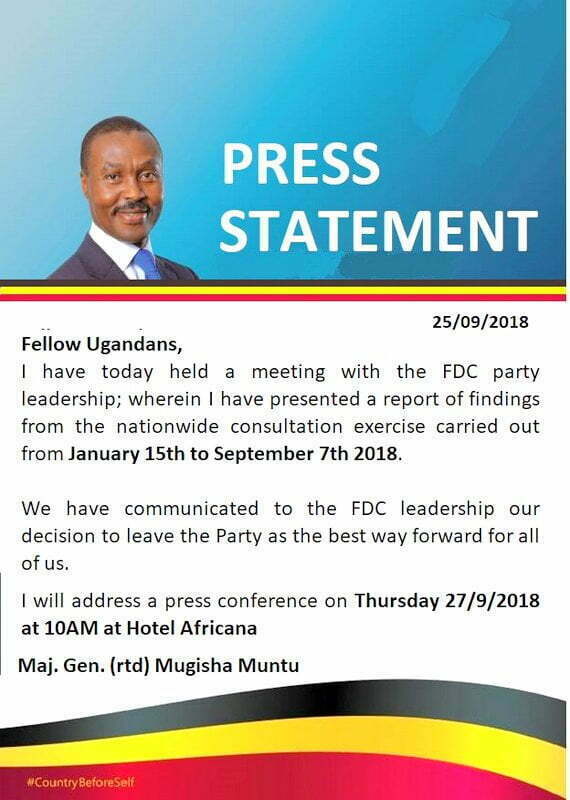 Statement announcing Former Forum for Democratic Change (FDC) President Maj Gen Gregory Mugisha Muntu having quit the party that was released prematurely according to him. Amuriat ‘s team included Rubaga Division Mayor Joyce Sebugwawo former Party Administrator Wycliffe Bakandonda, Kawempe South MP Mubarak Munyagwa and Wakiso party chairperson Caleb Muhanguzi. The meeting ended prematurely after some FDC youths stormed Fairway Hotel and demanded that Amuriat leaves. 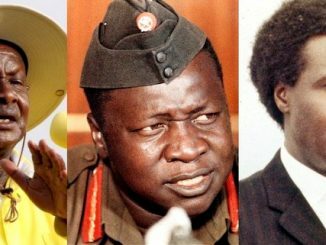 In a statement released moments later, Amuria also stated that from the discussion of the findings, Muntu and his team stated that they were not opposed to Amuriat’s leadership of FDC and that FDC fidelity to the values, principles, objectives/mission and strategies for which it was founded are not contested. 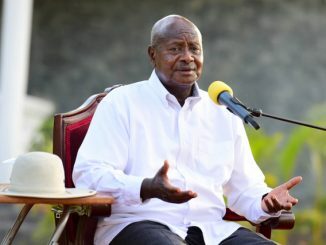 “We agreed that FDC has remained true to our promises, pledges and compact with the people of Uganda to offer an alternative leadership that espouses the dignity of the human person, merit based leadership, social justice and equal opportunity to every Ugandan,” Amuriat stated. Statement released by Former Forum for Democratic Change (FDC) President Maj Gen Gregory Mugisha Muntu moments later. He added that at the point of their departure, the Muntu team did not have a point of casual or fundamental disagreement, but had jointly agreed that FDC institutions will scrutinize their findings and formally report back to Gen. Mugisha Muntu.